Sports fishing with Come Fish Panama during the month of June we had Leo and his son Sebastion from Boca Raton, Florida and anglers Wayne and his son Brian from Vancouver, Canada to finish off the month. 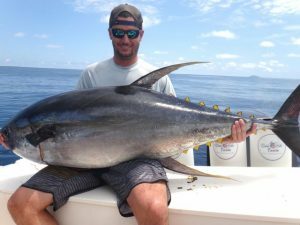 This time of the year is what we call “Cow Tuna Time” and many were still to be caught, fought, and some released once boatside. As always we try and keep what we will eat and the rest we release. 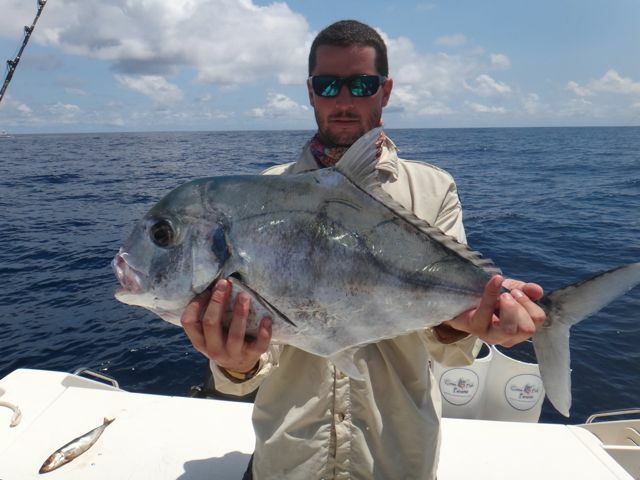 Our June anglers loved every minute as they fought these Giant Tunas at the Hannibal Bank and others at The Triangle. Isla Montuosa has been quite for some time but that area will soon startto pick up for Wahoo, Amberjack, Cubera Snapper, Mahi/Dorado and Black Marlin as we head into July and August. This year we will be closing our door the last day of Aug. and reopen for the New 2014/15 season on Dec. 1st, 2014.
normal pattern we encounter during this time of the year, so we are just about sure things will start to change any day now and the wet season will go into a full swing. But for now will take it as it is and how it goes! With these conditions and our anglers all hooking up with Yellowfin Tuna time and time again, we were very happy to be able to spot all our anglers a chance to fight a Cow Tuna during their visit. Most of these Yellowfin’s were feeding on sardines and not even interested in Bonito but a few chased a tossed Blue Runner as an extra meal. The Triangle continues to provide heavy action on the Yellowfin Tuna bite which we continue to point the bow in that direction once we leave the lodge. 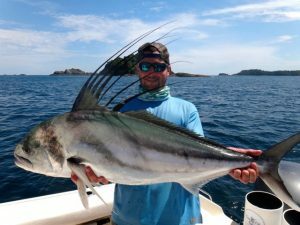 We did manage to swing by Rooster Rock to score a Roosterfish for Sebastian who was looking to bend a rod and check mark it off the bucket list. 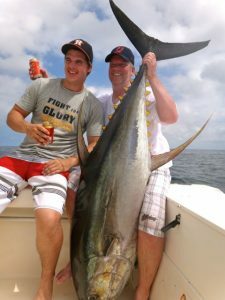 The bottom fishing has dropped off a bit on the hook up ratio but we expect that to turn around within the next few days. 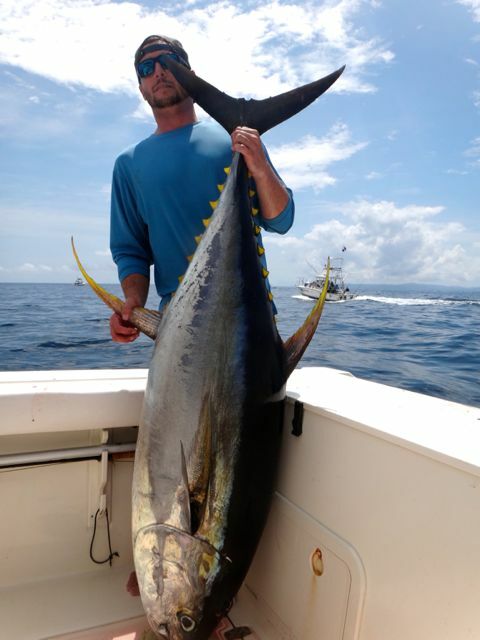 But once again, it was all about Yellowfin Tuna bite this month for all these anglers that came to bend a few rods. 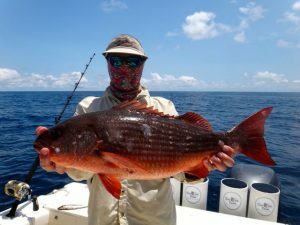 We once again would like to thank all our anglers that came to sport fish with us this month and truly hope to see you here next year and do it all over again. For the father and son team of Wayne & Brian along with Leo & Sebastian Billfish season is not far away. 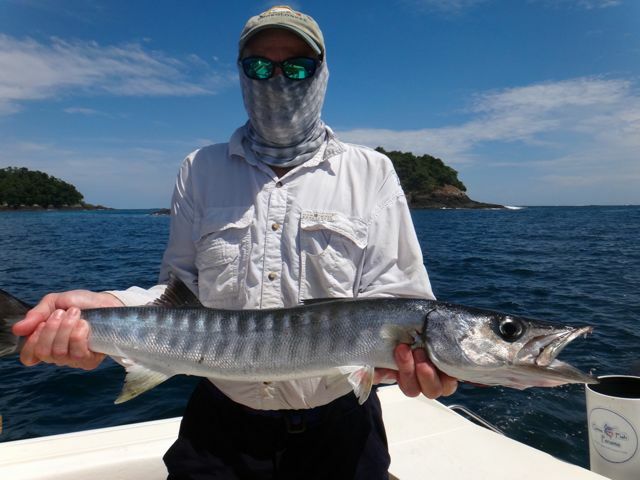 We look forward to your return in the near future and for those who are considering fishing our waters we invite you to join us in 2015- You will not be disappointed.